Templates are a big thing for us—mostly because they save you time and effort, which we love. As with all of our files (amongst other things! ), you can create Templates for the various payment schedules that you might use. 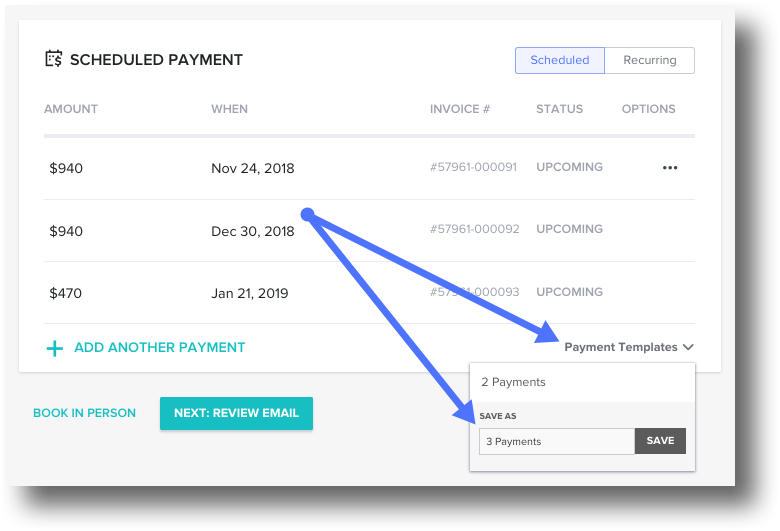 Saving a payment Template will allow you to utilize a payment schedule and amount structure over and over, applying to any Invoice or Proposal to automatically calculate payments and due dates based on that Project's specific information. For example: do you regularly split your Invoice totals into thirds, requiring payments on the date the Invoice is sent, a date halfway between now and the Project, and then a week after the Project is complete? Cool—save that. Or really, whatever you want! 1. Begin by creating an Invoice, a Proposal, or a Template of either. 2. Create a payment schedule in the Payment Plan section. 3. When the plan is to your liking, click the Payment Templates menu. 4. In the Save As field, enter the name of your Template. Now, you can apply this payment Template to any Invoice or Proposal file (or file Template) moving forward! How do a record a payment that I received outside of HoneyBook?